Mitt Romney’s campaign has bought air time in Pennsylvania, saying in a memo that the Democratic-leaning state now represents an opportunity for the Republican campaign. This is a major move by the Romney campaign. While Ohio is a traditional swing state, and has garnered much deserved attention this election cycle, Pennsylvania is a center-left state, going Democrat in every presidential election in the last two decades. 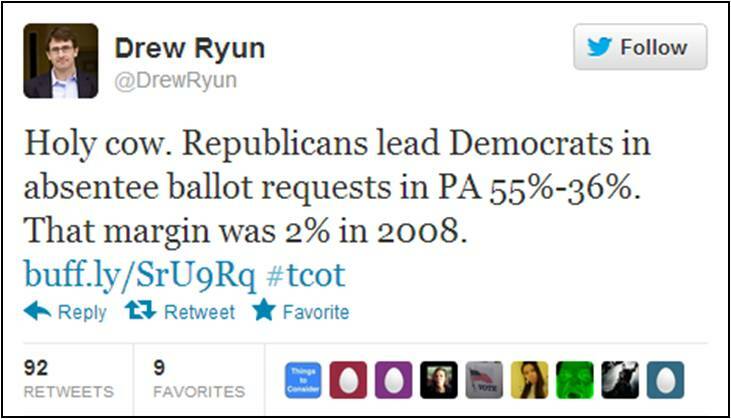 A month ago, Pennsylvania was swinging as much as 12% in Obama’s favor–now RealClearPolitics has it rated as a toss-up. Romney’s move in to the state shows he sees an opportunity to expand the map, making a show of strength in a play for more than the necessary 270 electoral votes to take the White House. But that doesn’t mean Democrats won’t try to spin it their way. Apparently Obama for America thinks that Romney is searching for other electoral avenues, and that myth is being echoed by none other than that harbinger of doom, Lis Smith. You know her–she’s the one that seems to follow around soon-to-be-failed Democrat politicians until they sink faster than a skydiver at 128,000 feet. Suffice it to say, if Ms. Smith is touting something, you know Democrats are desperate. That, and they can’t do math. Since Democrats like Ms. Smith seem to struggle with simple math, let’s break it down for her. In 2008, McCain won the absentee battle by just 2%. Romney’s ahead by 19% in absentee voting. That’s a 17% swing, in a state that Obama won by 10% in one of the biggest Democrat wave years in electoral history–the kind of year that Democrats won’t enjoy this time around. That’s the kind of shift that presidential campaigns are supposed to notice–the kind of shift that makes you buy ad time to take advantage of the positive momentum. And Democrats like Ms. Smith know it. It’s their jobs to spin it, cover it up, and twist the facts as much as possible in an effort not to look weak. To quote our president, they’re just assuming the role of bull*****er. But ultimately it just makes them look desperate. All while the Romney campaign shows its strength, expands the map, and moves one step closer to taking the Oval Office. Democrats can have their spin–I’m content with the facts.